The Internet has gone on high alert for a photo released by NASA that shows a figure on Martian rocks that looks strangely like a crab. Even more pictures have recently been released that some people insist indicate there really is life on Mars. NASA has not said anything official about the photos. However, the recent discovery of liquid water on Mars has refueled people’s suspicions about the photos. As for the crab-shaped rock, debates range from the figure being a fossilized crab to just a bunch of rocks that our brains are trying to make into a familiar pattern. What do you think? The image was uploaded by NASA from its Mars Curiosity Rover. One of the first to spot the alien crab was UFO Sightings Daily, according to io9, but other media quickly ran with the story. Some believe that the zoomed-in photo looks strangely like an alien crab, possible a fossilized one, Daily Mail reported. It’s seen in a formation that looks like the mouth of a cave. 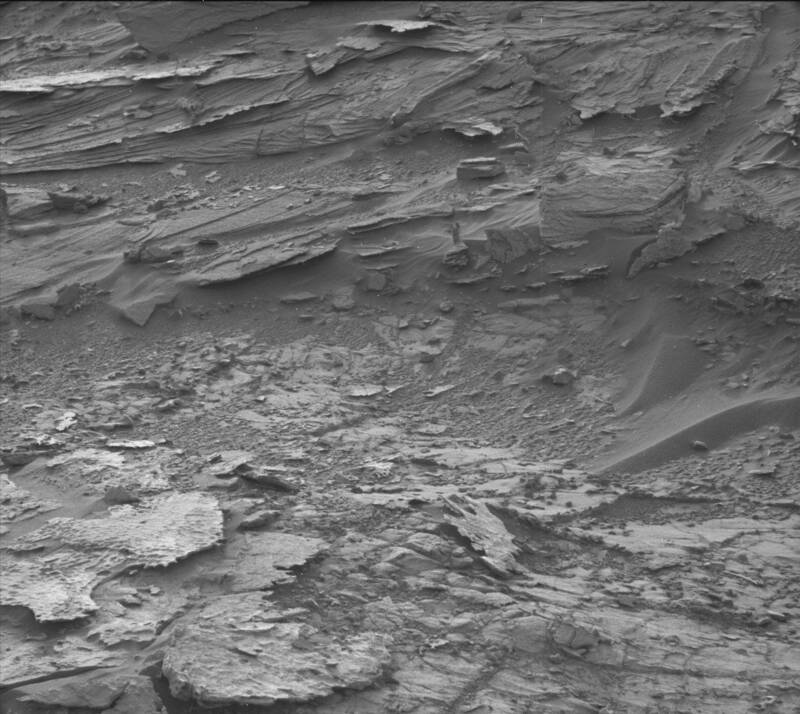 The sedimentary nature of the rocks give off the appearance that water might have been in this location, but are more likely wind-weathered. The alien crab isn’t the only thing that’s interesting in the photo. In a Reddit.com thread about the photo, readers brought up other interesting sightings. One person used Photoshop to sharpen the image and claimed to be able to see eyes and a mouth. Another person thought he could see another crab higher up in the photo. The Reddit user mentioned in another post that he was also interested in a square-shaped object on the ground just in front of the crab. This isn’t the first strange object people have thought they saw from NASA. The figure of a woman can be seen near the top of the above photo, just slightly right of the center. 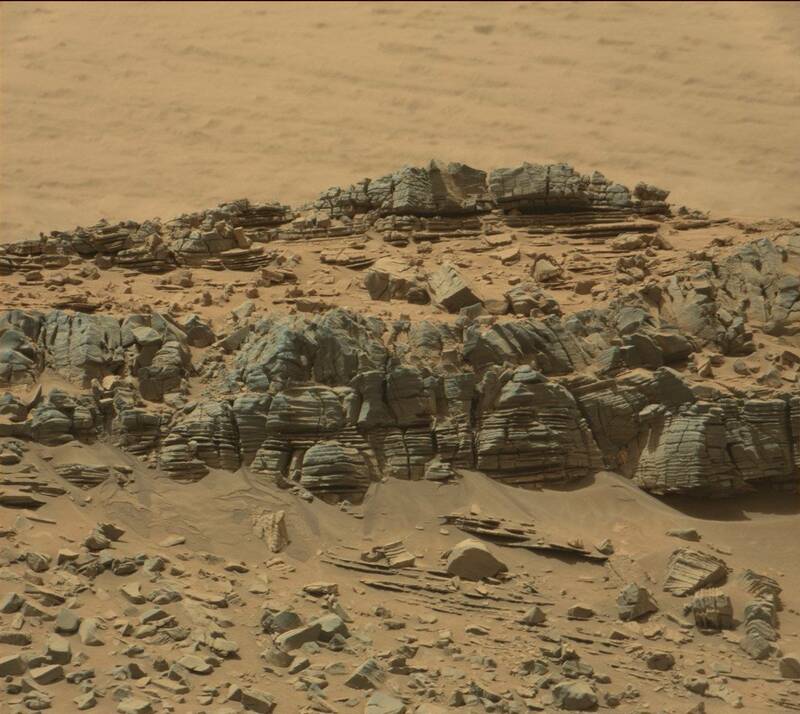 NASA itself tweeted a more scientifically interesting photo that showed Mars rocks rich with silica. Rocks like this can preserve ancient organic material. Scott C. Waring of the UFO Sightings website wrote that the above photo looks like the craft is about 3 meters across and could only hold a few passengers. He then went on to mention that the “figures” they found on Mars were about 8 cm tall, so of course the craft could hold 20 to 40 passengers. And finally, there is the photo in the Twitter post below. This one really appears to just be rocks, but some believers are saying it looks like an iguana of some sort. What do you think? Pareidolia is the term used to describe when we see patterns where there really aren’t any, like seeing Jesus’ face in a grilled cheese sandwich. The Huffington Post interviewed SETI director Seth Shostak, who said that’s the case for the recent set of Mars photo sightings. The brain can make shapes out of random objects. This can help us if, say, we’re trying to spot a predator out to get us. But it also causes us to see all sorts of crazy things in off-planet rock formations. A photo that NASA posted from Mars has caught national attention as people claim they can see an alien crab on the Martian rocks.